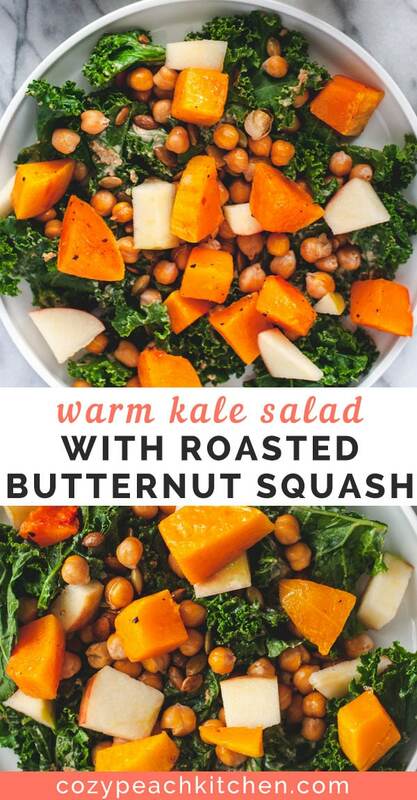 This warm kale salad is an easy vegan fall recipe that’s perfect for meal prep or as a holiday side dish. 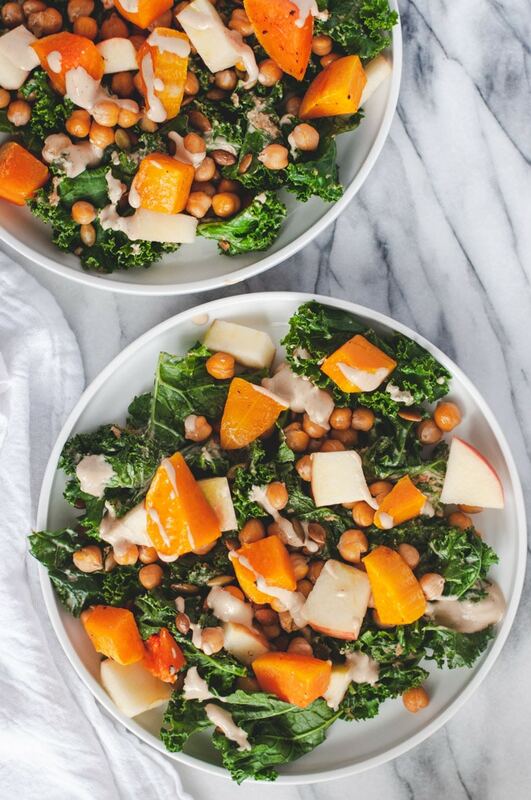 It’s made with butternut squash, pumpkin seeds, and roasted chickpeas and topped with a creamy tahini dressing. Does it get any more fall than that?! 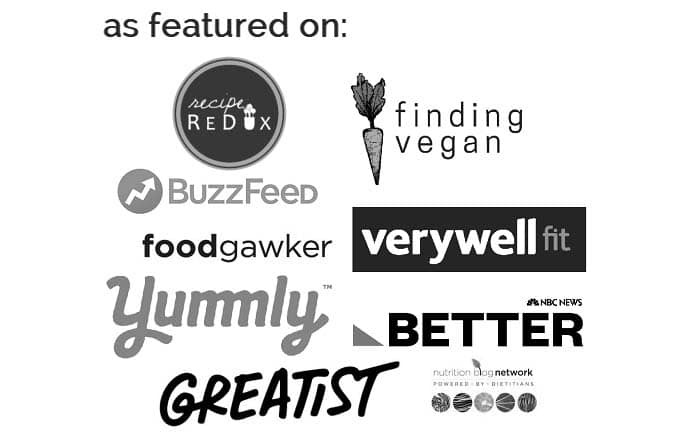 Would it be just the most utterly millenial dietitian thing ever to say that I love kale? Well, too bad. I love kale! And what’s not to love? Kale is high in fiber and full of a variety vitamins and minerals. 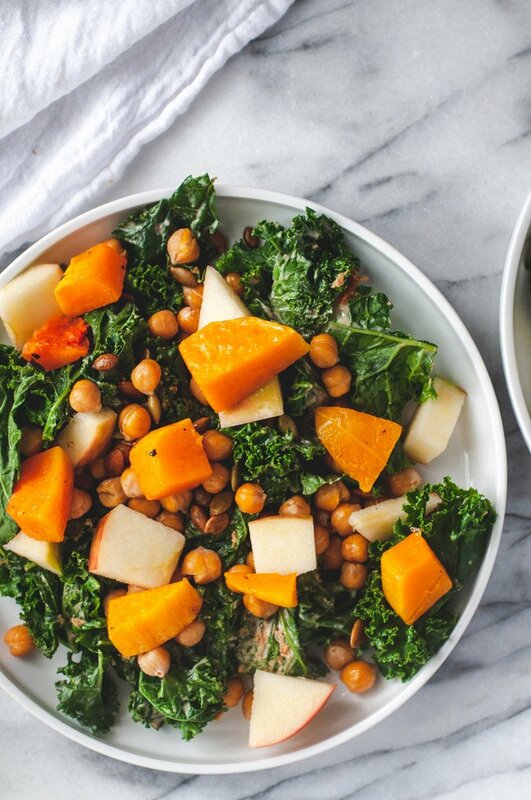 It’s perfect raw, cooked, or lightly sauted, like in this warm kale salad. And I’ll be honest: cooked and lightly wilted kale is one of my favorite veggies (greens?) ever. Not only is the texture great and a bit easier to chew than with raw kale, but cooked kale can be easier to digest. Especially if you don’t usually eat a high fiber diet, kale can be a bit hard on the system. Lightly steaming or sauteing kale breaks down the cell walls, decreasing some of the work that your gut has to do. The butternut squash, pumpkin seeds, and chickpeas are all roasted on the same pan. That means you almost have a one sheet pan meal! You can enjoy this salad for meal prep throughout the week or double the recipe and use it as a side dish during the holidays. 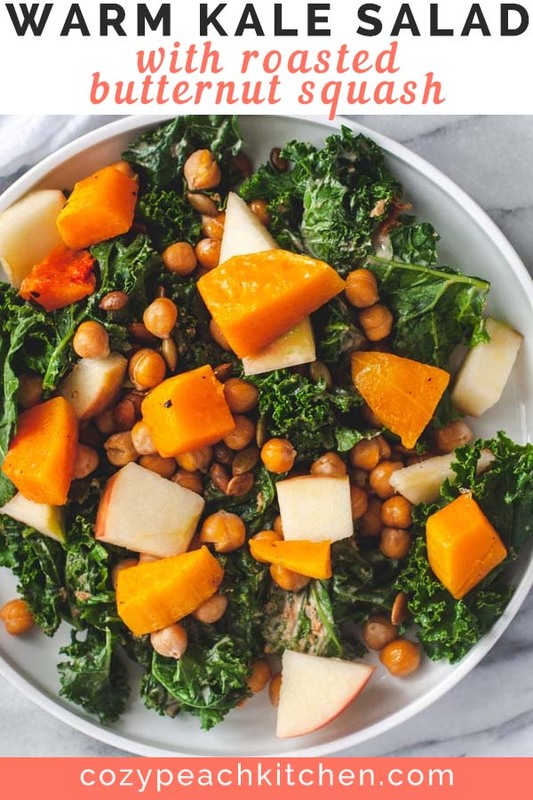 This kale salad is loaded with healthy fats, plant based proteins, and veggies, meaning you’ll be full from a well balanced meal. Butternut squash season is upon us and I couldn’t be happier! 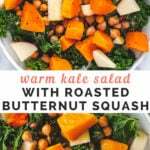 I usually buy precut butternut squash because it cuts down on prep time, but they were out at the store when I made this recipe. Lucky for you, that means I had an excuse to make a “How to cut butternut squash” diagram! Start by peeling the butternut squash. You may find it easier to peel the squash if you cut it in half first. 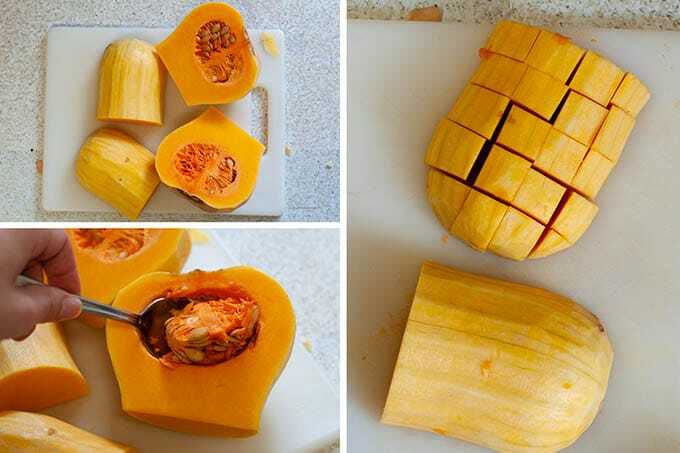 Cut the squash in half lengthways. Using a spoon, scoop out the seeds. Flip the squash over so that the flat side is on the cutting board. Slice into 1 inch cubes. You’re done! This is the third recipe in my Meal Prep Monday series. The first week I shared an easy Vegan Quinoa Taco Salad and last week I shared this Curry Chickpea Wrap. This kale salad is a bit of a cheat because it only makes four servings, but it’s still a great meal prep recipe. Don’t forget to top this salad with Tahini Goddess Dressing – seriously, it’s one of my favorite dressings ever! Or try out another of my favorite kale salads. 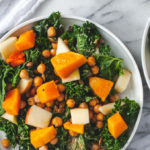 This warm kale salad is an easy vegan fall recipe that's perfect for meal prep or as a holiday side dish. 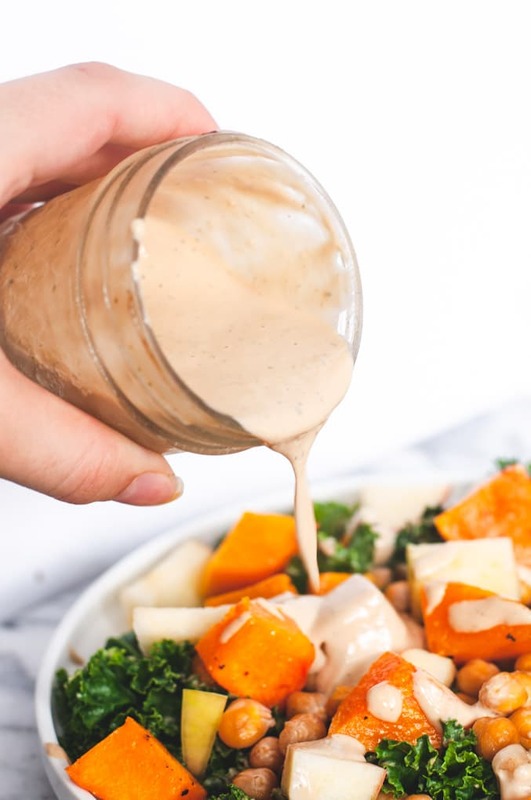 It's made with butternut squash, pumpkin seeds, and roasted chickpeas and topped with a creamy tahini dressing. In a large bowl, toss the butternut squash with 1 tablespoon oil, 1/4 teaspoon salt, and pepper. Place on the sheet pan. In the same large bowl, toss the pepitas and chickpeas with 1 teaspoon of oil and 1/4 teaspoon salt; set aside. Bake the butternut squash for 20 minutes. After 20 minutes, add the chickpeas and pumpkin seeds to the sheet pan. Return to the oven and bake for 8-10 more minutes. Stir the pumpkin seeds and chickpeas halfway through. Meanwhile, in a large skillet over medium heat, heat 1 teaspoon of oil. Add the kale and saute until deep green but not wilted. 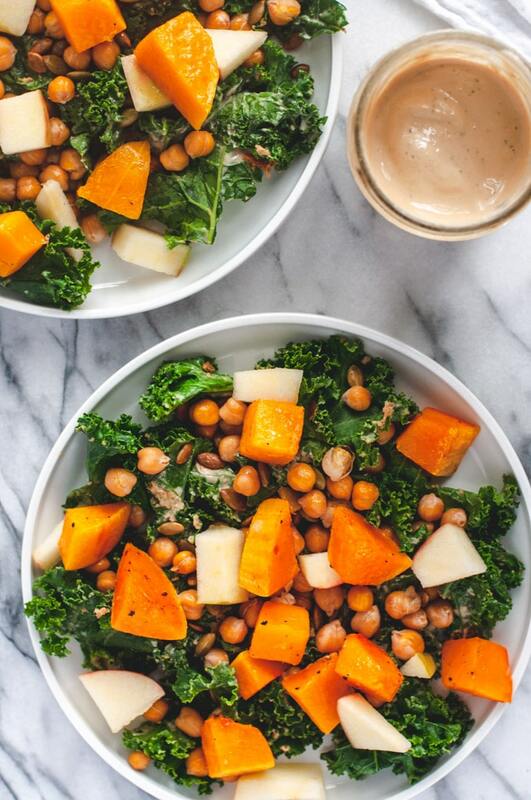 Remove kale from heat and toss with squash, chickpeas, pepitas, apple, and tahini goddess dressing. Enjoy as is or serve topped with fresh parmesan.